Last week wasn't the best week ( chess-wise ) for me. So, I wasn't really positive, nor probably in the mood, for a standard game, but having checked that Anand held an easy draw playing for 4 hours or more, I thought I could manage a meagre 2 ! In the end just 90-minutes and one move was all it took...could have been a cup-final ! Open Sicilians ? I love them, why would anyone play 2.c3 and miss out on the fun....?! Here's two blitz games I played today, apparently classified as B32 ( Labourdonnais Variation) but the first did seem a bit like a Dragon ( or Najdorf ? ) to me. So, game 1...I tried to play the Maroczy Bind with c4, and a later f4....did it work ? Well, certainly mistakes on both sides, but I felt happy playing it. Black played 13...f5 and this was was wrong, and although I thought about it for a while, after 14.Qxd6, Black's position seems to fall apart. I spent some time thinking after move 14 above, but essentially I accepted that Nxe4, Bxb2, Rb1 was good..and after that, I had a nice victory. On to Game 2, and much more like the Labourdonnais that I expect with an early e5 from Black. Not sure why, but certainly after this next move.. Sadly, he was one of those players who doesn't like to be mated, so I waited a minute-plus for the clock to run out after 19.f6...so he has a "time-expired" loss, so much better than mate ! and it gives me more more time to savour the win!! It was a last minute decision to enter, as I had a cancelled appointment, so I didn't really "prepare", just signed on a few minutes before and waited for the parings. I have to admit the "2pm" round is rather strange, since it is always an open with no lower section. This means that the lower-rated players ( like me ) invariably end up against an opponent 300 or 400 points above us. I'm sure its a great learning game, but sometimes, it would be nice to have a sporting chance. Tonight I'm up against an 1848-rated player ( that's 360 higher than me !) and he replies 1...e6 to my 1.e4. 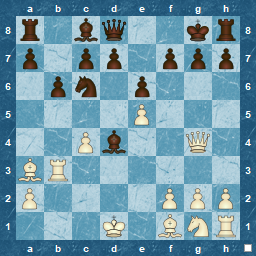 Great, a French Defence, long one of my least favourite openings as White. However, this time, instead of my usual slow King's Indian Attack, or pretence at knowing Tarrasch, Winawer or Wing Gambit theory, I tried something different, the Réti Gambit, courtesy of author Thomas Johansson. Seemed like a lot of fun to gain, so what did I have to lose ? I'm not a gambit player ( I decline even the King's Gambit, if possible) but the Réti Gambit offered fun and the chance not to play in Black's arena. I was ready to give it a shot ! A pleasant way to while away 50 minutes over an evening and imagine that it really is your ELO rating ! I used to have an very bad time with the Sicilian...any Sicilian !! When I first re-started chess I played correspondence and always met 1...c5 with 2.c3, the Alapin Sicilian. I have to say that I had very little success, which only increased my dislike of facing the Sicilian. This is a shame, since it is probably the most popular "non-e4" opening, even at amateur level, so not being able to play against it is a serious problem ! Here's a Blitz game played today....Lasker Variation...Sveshnikov. Theory ( and popularity ) goes for the move 7.Bg5, but 7. Nd5 avoids lots of theory and is producing some good results. 7....Nxd5 is forced, but don't re-capture with the Queen, as you lose time to Be6 ! On move 8, there are two main Black choices, Nb8 and Ne7. More popular is Nb8, but I don't think there is much between them, at least at my level. The reply to both is 9.c4, the solid move, but 9.Qf3 is an interesting alternative. I didn't see the wonderful 10.Qa4, which is probably a winning move against the apparently natural 9...a6. Regardless of the final loss, I really enjoyed this ! Monthly Standard March ( Round 4 ) : A Prize win !! Last round for this month and an enjoyable, but, in my opinion, a strange game. I played far too passively in the opening, and did not take advantage of Black's many initial pawn moves. Not to say that I played badly. I developed pieces, had a plan, and generally felt good about it, but if I had been more active, I feel I was in a fine position to take advantage. Probably my first slow-time French Defence, although it was a roundabout way to reach it. Black initially played many pawn moves to gain space and initiate a Queen-side advance, but missed an obvious threat, lost a pawn and ,as I had pieces in the right places, I was able to create a second weakness and exploit it, leading to further material gain.